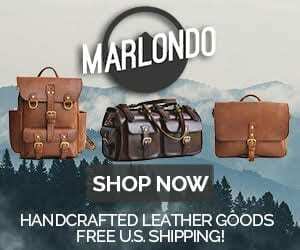 The Horween Leather Company was established in 1905 in Chicago, Illinois by Master Tanner and founder Isadore Horween. At the time, there were thousands of tanneries in the United States and at its peak, dozens in Chicago. Isadore Horween felt that he could produce a better tanned hide based on his tanning experience, and soon the Horween name was known for its high quality leather. Today, Horween is the only tannery in the Chicago area, and one of just a handful of commercial tanneries in the United States. The tradition of excellence that Isadore established is still very palpable today for Horween’s current owners and management. The commitment to quality craftsmanship and superior leather is still very much alive. 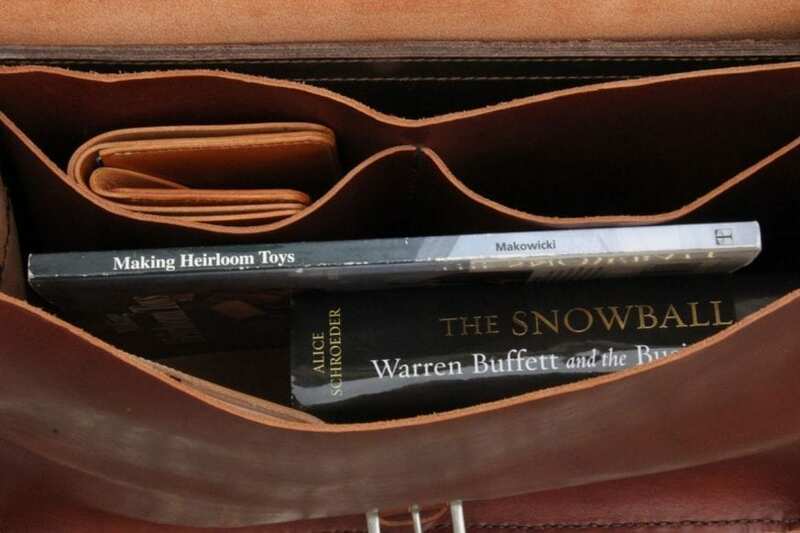 BestLeather has had the fortune of working with Horween on a number of past articles and we are fortunate to work with Horween on a series of upcoming articles. Horween agreed to send to us three of their top selling leather hides for us to post articles on. We were sent one hide each of their Essex, Chromexcel, and Latigo leathers. These leathers are all somewhat different in application, appearance, and feel, but one common thread is that they are all beautiful leathers that are in high demand. In fact, many of the goods we review at BestLeather are made with these and other types of leather from Horween. 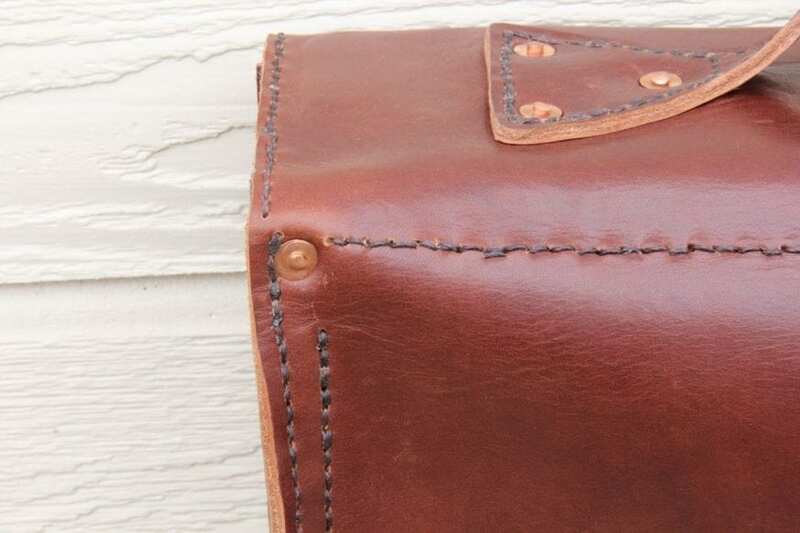 For this article, we will take a look at the Essex leather that Horween sells. 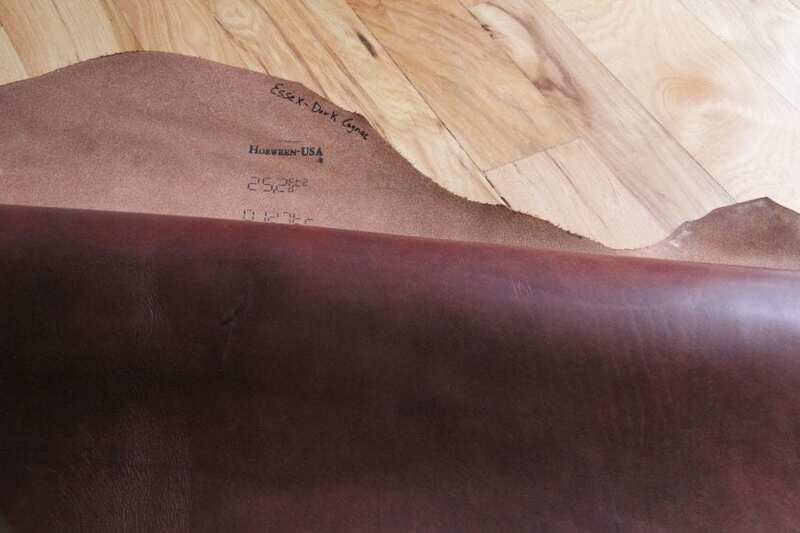 The creation of Horween’s Essex leather was the brainchild of wanting to tan cowhide in the same manner as tanning Genuine Shell Cordovan (Cordovan being horsehide). When Horween constructed this idea, they knew that the result would be extraordinary. Extraordinary results normally take extraordinary work to accomplish, and this was the case for Essex. It took Horween two to three years of trials and production runs, and according to their own works, they eventually “nailed it”. Nailed it, they have. Like Genuine Shell Cordovan, Essex is straight 100% vegetable tanned. It similarly uses the same blend of liquors and extracts as the Cordovan. The result is a leather that is smooth to the touch, that feels durable and strong, yet is supple enough for the most sophisticated bags and leather goods. The leather is also full grain, which means that it has not been altered in a way that weakens it’s fibers or structure. It is the outermost leather of the hide, which is the strongest and most durable. Another characteristic of Essex is its high oil content. In making their Essex leather, Horween puts the hide through a fat liquoring process that enriches the leather with high quality oils, which, in turn, help give the leather not only long life, but the ability to age well, and look better and better over time. The leather is also hand glazed and then given an aniline finish. For this project, we decided to make a simple messenger bag from the hide that Horween sent to us. 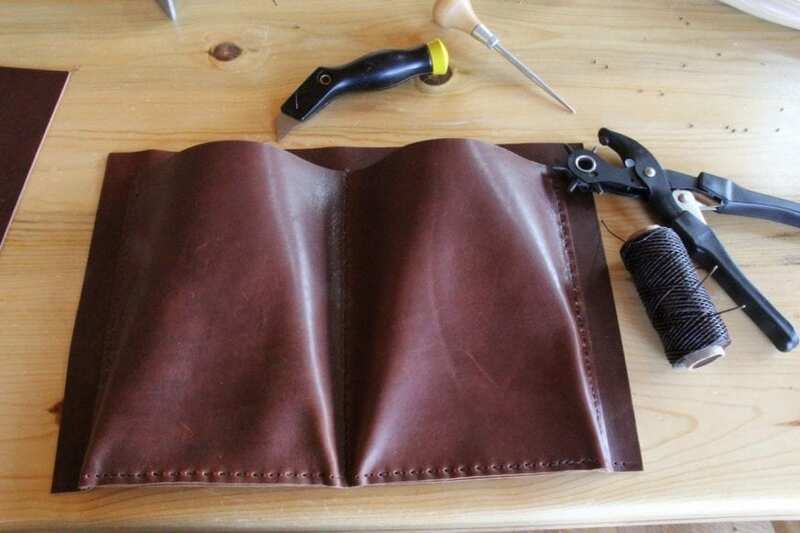 As amateur leather crafters, we knew that what we would make would not be to the high standards of goods we normally review, but we wanted to get a feel for the Essex leather and learn about it from the experience of working with it. 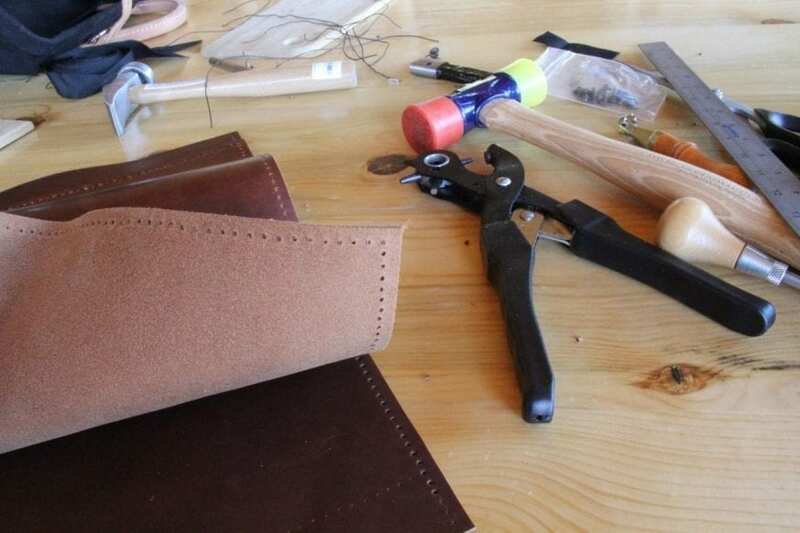 What we learned is that the leather is very supple, is gorgeous, and is easy to work with. The hide we were sent weighs four to five ounces. For some vegetable tanned leathers, that thickness would result in a leather that is fairly stiff and not very flexible. The Essex, on the other hand, is very supple, even at that weight. 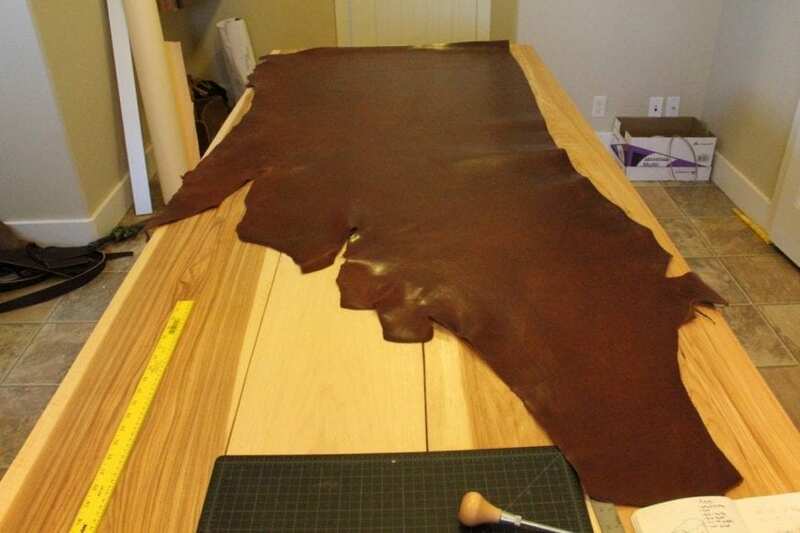 The process for creating the Essex leather is the reason for this result, with the oils and liquors used and the process for finishing each hide. If you desire stiffness in a thinner leather, the Essex would not be the best choice. If you desire a leather that is a little thicker, but still very malleable and fine, then Essex is an excellent choice. The messenger bag that we made for an example turned out beautifully, but in hindsight, we probably would have made a bag that does not require as much rigidity. The design of this bag was fairly deep and needed to have some rigidity to hold up appropriately. The leather is supple enough that when you lay the bag on its bottom, it sags a bit. We decided to put the handle on the very top of the flap, and when lifting the bag up, the flap sagged as well and the result was that the bag did not hold up very well with that type of handle. It would have been better to put handles on the back of the bag. Since the rivet holes were already punched, we ended up adding a thick piece of leather on the underside of the flap, then lined the underside of the flap with pigskin. As a result, lifting the bag with the handle is now very secure. The lesson learned is that Horween’s Essex leather is very supple, and the product design needs to take that into consideration. 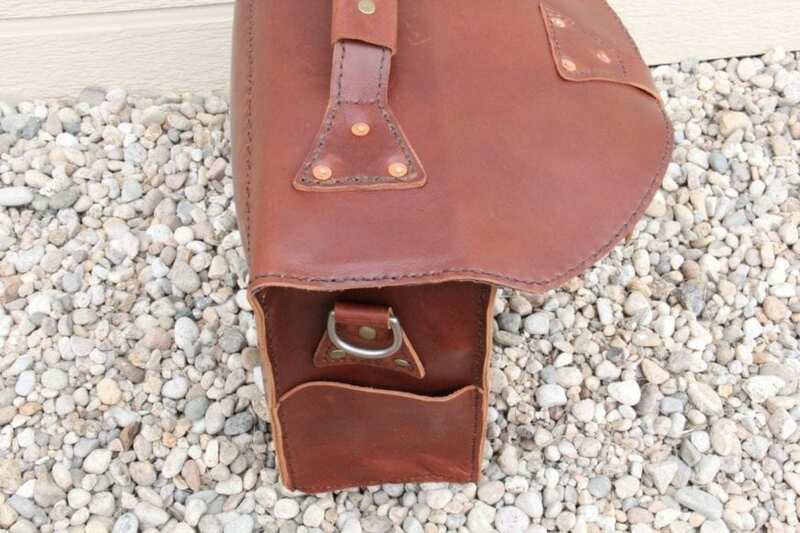 This particular messenger bag could be made with Essex with excellent result, but in a thicker weight, probably eight or nine ounces, as opposed to the four to five. We also could have lined the whole bag with a stiff pigskin lining, and that would have given it sufficient structure. Better yet would have been to choose a design that marries well with supple leather and that accentuates it. One company that does this well is Libero Ferrero. They use the Essex Leather from Horween and the bags they craft are beautiful and designed extremely well. 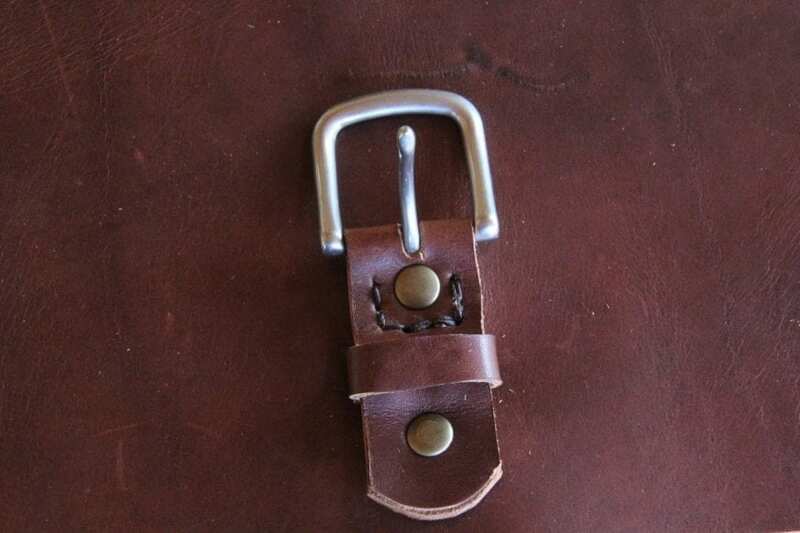 We will be doing a follow-up article on the Essex leather and looking at one of Libero Ferrero’s bags in greater detail. As discussed, Horween’s Essex leather is very supple, but that does not mean that it is not durable. To the contrary, this leather is made to last for generations. Vegetable tanned leather by nature is made more beautiful over time as it ages and patinas. It stands up better to the elements than straight chrome tanned leather, and the thickness of this leather will stand up to years of use. The Essex hide sent to us is what Horween calls their Dark Cognac color. I tend to love slightly darker brown colors on leather and it was not a surprise that I loved this color. It is a dark brown and in the right light has a small hint of red. The Essex has a high oil content which yields a finish that has a little bit of sheen to it, but not too much. 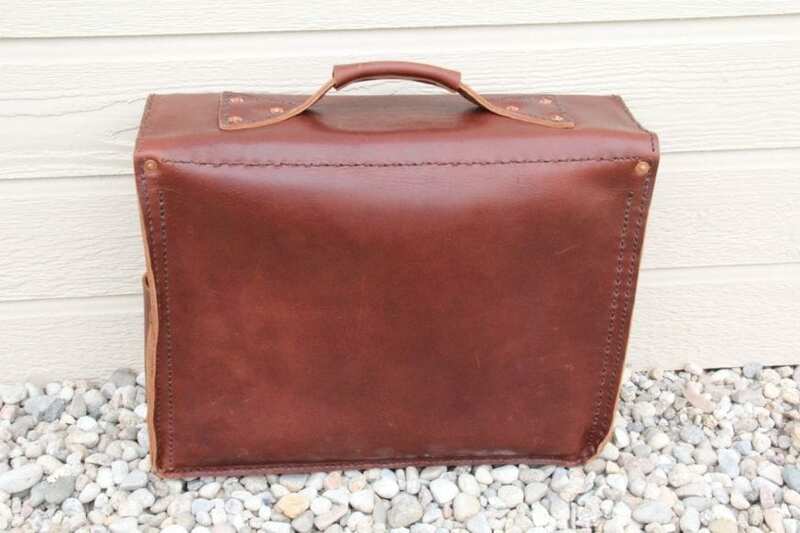 The underside of the hide is a light brown color, but it is also finished beautifully, so we felt it not necessary initially to line the messenger bag. Another thing you get with Horween leathers are hides where the color is struck through. This is not very common with most tanneries because it takes longer in the large drum dyers and requires more dye to accomplish, which makes it more expensive. The result though is that the center of the hide is not blue or a really light tan. It is the same color as the entire hide, through and through. The Horween Leather Company produces some of the finest leathers in the world, that are renowned for their quality, beauty, and durability. 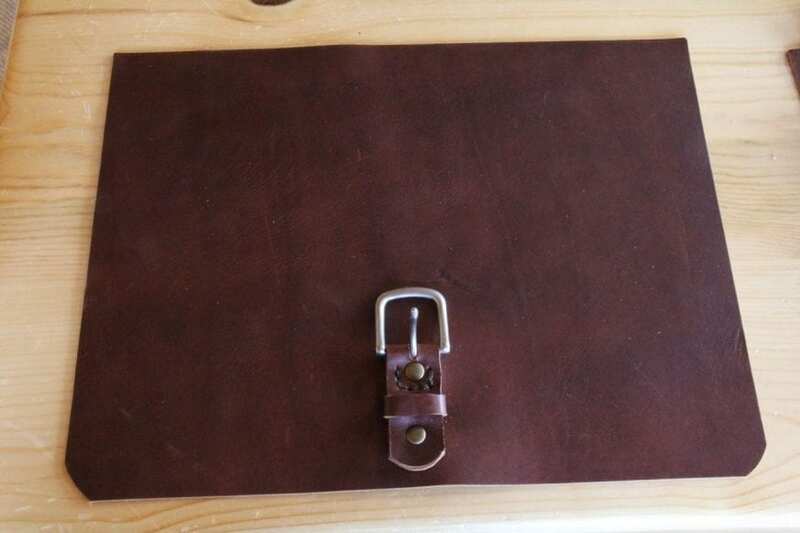 Their Essex line of leather is a very beautiful, supple leather that has a wide range of uses. 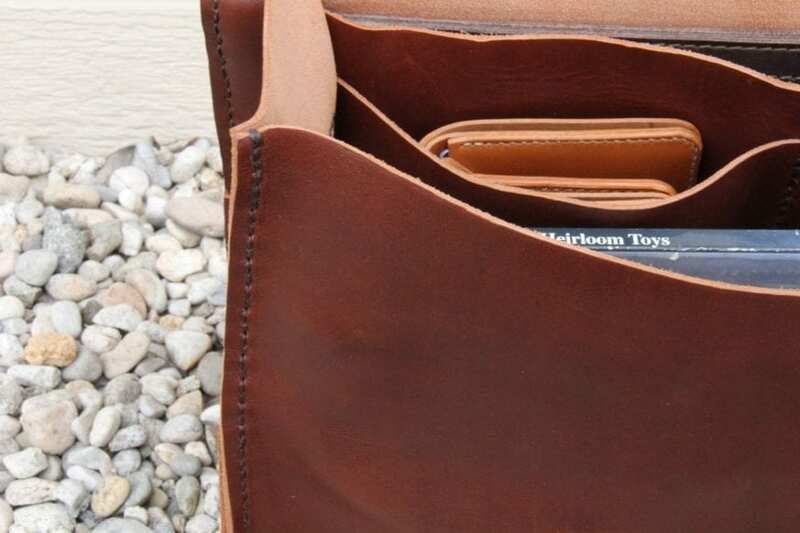 Whether you are making wallets, duffel bags, purses, handbags, or any other consumer good made from Essex or buying said goods, Horween’s Essex is a fantastic choice. 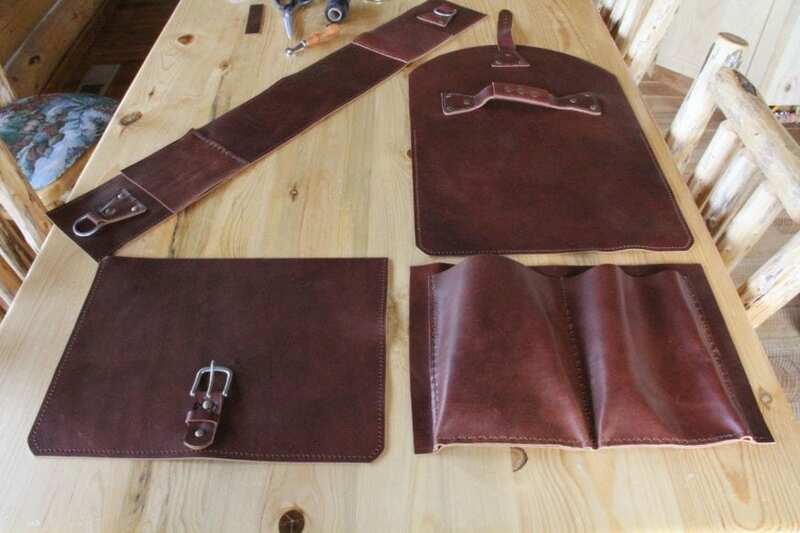 Below is a sequence of pictures from the hide we received from Horween to completion of a simple messenger bag. 4 Comments on "Horween Leather Company – The Essex Line of Leather"